I think that covers a lot of ground. I don’t consider Tormato a classic Yes album, despite loving many of the songs on it. To me, the ones above convey the magic of the classic Yes years. Great suggestions, Fred! Everything on your list could be described as a classic. I also would love to see some of the early songs like Time and a Word feature. I also agree that the definition of ‘classic’ Yes should be expanded significantly from what’s on this album. It certainly must contain Time and a Word to Drama. Thanks for the comment! To Be Over which I have heard live just not seen it live.great great tune.Looking Around Dear Father I could go on and on much like I believe Yes will keep going on and on well I at least hope so..
Great suggestions, Paul. Chris Squire said that he thinks Jon Anderson may be back in the future for a special occasion or two – maybe they will make some of your dreams come true if that happens! I did wonder at the time of the odd choices, and that it was only a single LP. 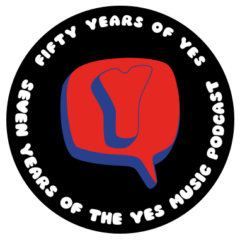 A feature of Yes albums is that the last song often makes you want to play the whole thing again. That’s why I’d have Awaken last. Excellent choices, Jeremy! I’m very glad to see Time and a Word there! The market is now flooded with ‘best of’ compilations but I wonder if any of them are as good as your collection?